In October 2013, led by a professional guide, I visited Mount Rainier and its vicinity, the locale of numerous alleged sightings, track discoveries, and photographs of the elusive creature. Unlike other mysterious phenomena such as psychic powers, ghosts, or Bigfoot, there is no doubt that crop circles are real. The real question is what creates them. A much-hyped two-hour Discovery Channel “documentary” delved into a decades-old pseudo-mystery known as the Dyatlov Pass incident in which nine Russian skiers died under unclear circumstances in the Ural Mountains. 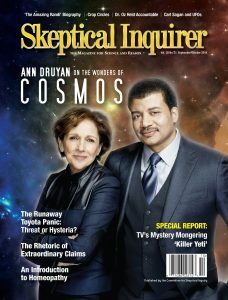 We present a condensed version of an earlier interview about Ann Druyan’s experience with the first and the new Cosmos series by Josh Zepps for our Center for Inquiry’s Point of Inquiry podcast.